I call Niko Porlier, the 17 year old guitarist, vocalist and eldest member of Edelweiss, an English dancehall influenced band from Pennsylvania. 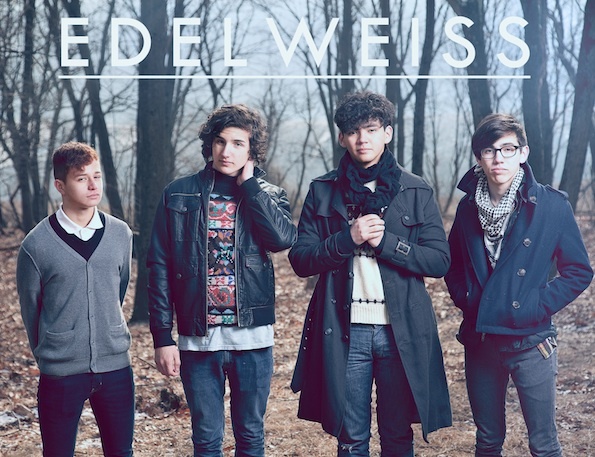 You’ll be hearing about Edelweiss sometime after September 13th when they release their debut EP, Pre Columbians. We make small talk for a few minutes noting how lovely the California weather is where I am and how it’s 100 degrees in Stroudsburg, PA – the birthplace of the talented quartet composed of two brothers and a couple of friends. Luckily through the conversation I discover that the band has a basement where they’re able to cure their east coast humid sweats for days at a time while creating music that could easily sit on shelves alongside English bands like Bloc Party, The Arctic Monkeys and The Wombats. The Owl Mag: Your name, Edelweiss, is it pronounced “Idle-vice” or “Eedle-wise?” And where does that even come from? The Owl Mag: So you and Coby (brother, 15 years old, drums) started making music together? Was there ever any intention of forming a band? Niko: We had started coming up with musical ideas and recording demos on our computer that weren’t really all that great, but the goal was to make music that we would want to listen to. There’s so much music out right now, but none of it actually captured what we wanted to hear. The Owl Mag: So it began as a family affair including your father on bass, but now all members of the band are under 17 years old? How did that happen? Niko: Yes, originally father Porlier was the bassist and we had another drummer who was a bit older. We met some family friends at a New Years Eve party and was introduced to their son Tommy Vitale, our now bassist and lead singer. He wasn’t really a bass player or a singer, but we brought him over and showed him what we were working on. The Owl Mag: So, Tommy picked up the bass right away? Niko: He was pretty quick in learning it, or maybe just always had it in him. He had a bass lying around his house and brought it over and started playing these crazy lines. We immediately knew he was our guy. The Owl Mag: It’s hard asking a band to compare themselves to other musical acts that are out there, but do you feel influenced on a certain level by someone? Niko: Definitely. The Arctic Monkeys, Bloc Party, and The Wombats are some of our favorite acts, so we try to spin our own abilities and sensibilities into the music. The Owl Mag: You’re about to finish your last year of high school while your other bandmates still have a few years left brooding over homework, are you headed to college? Got a major? Niko: Still no major picked out, but there’s University of Stroudsburg just 15 minutes away, so I plan on sticking around to keep working with the band as much as I humanly can. The Owl Mag: Well, best of luck with the release and thanks for such a great album! Thanks for taking some time to talk to us, and you stay cool on the East Coast. Pre-Columbians, the debut album from soon to be voters Edelweiss will be out September 13th independently and you can pre-order the indie dance gem here.